A WARDROBE OF 7 TABLETS FOR YOUR BUSY FAMILY. 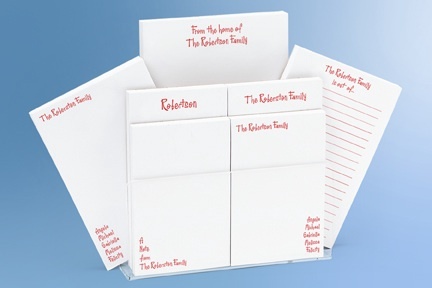 EACH TABLET IS 100 SHEETS AND OFFER A VARIETY OF LAYOUTS THAT HIGHLIGHT YOUR FAMILY NAME, AND FAMILY MEMBERS. PADS RANGE FROM 3 1/4" X 5" TO 5" X 8". THE OPTIONAL ACRYLIC HOLDER ORGANIZES IT ALL. AVAILABLE IN BLUE, BLACK, RED OR HUNTER. THIS ITEM WILL SHIP ONE WEEK FROM DATE ORDERED. ALL PERSONALIZED ITEMS ARE FINALE SALE.